Tessa began having seizures at five months old and she has just recently been given the diagnosis of Glut1 at age nine. For the first five years of Tessa’s life, she was on twelve different seizures medications that never made a difference with her 30-100 seizures per day, and resulted in terrible side effects. She had unexplained aggression, was not able to talk, and her attention could not be held for more than a few minutes. At age five, we decided to try the ketogenic diet which completely stopped her seizures from the first day of the diet. While on the diet, Tessa became a completely different little girl. She began talking and interacting with us, her aggression disappeared, and it seemed like a fog lifted off of her. After two years of being on this very restrictive diet, we tried to wean her off of it, but her seizures returned. ​After two more years of struggling with the diet and seizures, we made an appointment with a metabolic specialist at Cleveland Clinic Hospital. With the symptoms we were describing to the specialist, he immediately felt she had Glut1 Deficiency and ordered several tests. One of the tests came back seven weeks later as positive for the Glut1 Deficiency gene mutation. While relieved to finally have a reason for Tessa’s seizures, we initially felt very angry that this diagnosis was not made at a younger age. For five years of her life her brain did not get energy to develop; but we realize that we can’t change that now. What we can do is raise awareness so that children with Glut1 are diagnosed earlier and help fund research for a cure. Tessa is the most amazing and giving little girl, and we thank God everyday for bringing her into our lives. She never complains about being on this very restrictive diet, she never complains about having up to four therapy sessions a day, and yet she will worry and become upset if another child or adult is hurt, sad, or upset. She has helped us to understand the true meaning of compassion and love. Tessa is now 10 years old and continues on the ketogenic diet at a 3:1 ratio. She still has some brief absence seizures every day, but she seems to simply work through them and carry on. We have discussed adding on a seizure medication, but we are VERY apprehensive due to the side effects she experienced from the 12 meds she tried prior to starting the ketogenic diet. Tessa continues to learn, but at a slower pace. She will again be in a 6:1:1 class this fall with the same wonderful teacher she had last year. Tessa made great progress with her reading this year, though math continues to be a challenge for her. Her teacher and all of her therapists say she always puts forth good effort and we couldn't be more proud! Tessa also made great progress with learning to swim this year, though jumping in the pool is her favorite part! We continue to be amazed by Tessa's compassion, empathy, and sense of humor. We had another fundraiser for Glut1 in June, which was a huge success. We are hopeful that Glut1 gets more funding for research, and want to be part of raising awareness. Tessa is now 17 years old and she continues to brighten our world with her sense of humor and kind spirit. Tessa transitioned to the Modified Atkins Diet (MAD) in 2017, and is enjoying the less restrictive meals and increased variety. We travel to Baltimore, MD to the John Hopkins /Adult Dietary Therapy Clinic twice a year now, where they advise and support us . After doing all things keto for 11+ years, the transition to MAD was a difficult concept – mostly for us, her parents! We still haven’t given up measuring and searching for new recipes, but the more relaxed approach to meal planning has been a blessing. We continue to go to Dallas, TX once a year to see Dr. Juan Pascual. Tessa took part in Dr. Pascual’s Triheptanoin (C7) Study in August 2017, but we now know that the oil is not a helpful treatment for her. We still have a lot of hope that there will be other options for treatments and eventually a cure. At around age 14 Tessa began having movement episodes, that still continue. Being a teen and dealing with anything that seems at ALL off the “norm” is tough; and so this part of Glut1 is pretty hard on her. There are times when she needs to use a wheelchair as her feet have little control or times when she can’t control hand or head movements. Emotionally and physically this is her biggest challenge. She talks with a counselor at school a few times a week to try and work through these feelings as well as learning self-advocacy. Tessa is in a wonderful life skills classroom in school and will be in that program until she turns 21. She has developed a great social network of friends who do extracurricular activities together throughout the year. 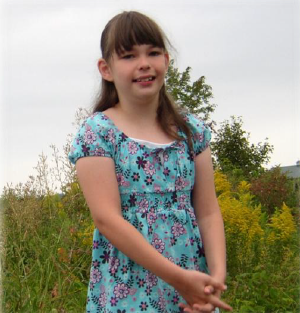 Tessa enjoys bowling, girl scouts, swimming, and though she doesn’t enjoy shopping she definitely enjoys new clothes! Our family has grown since 2011, and Tessa now has a niece and nephew that love her as much as she loves them! Tessa’s sisters live only a short distance away and she enjoys spending as much time with them as possible.